As I mentioned, I was seduced by the fumes, and overwhelmed by the need to have a Triangle Tank of my very own, despite the pattern's tongue twistiness. I found this Regal Silk yarn and cast on Sunday. I am really enjoying how in modular knitting there are better milestones to help you feel like you are making progress. What's that I hear? Stop knitting in the round then? Um, no. While I recognize that knitting fronts and backs separately would help give me faster milestones, I feel certain that - for me - it would lead to orphan fronts and backs lying about. And while that is little different than lonely top bits or lonely bottom bits, it works for me. And I don't like sewing and try to avoid it. Sure, people say you have better fit control with pieces, but there's nothing to say you can't dart or seam a piece knit in the round, should the need arise. (Or re-knit, but I don't like doing that either). 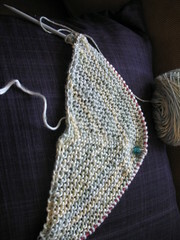 I heard tell that later there are some tricksy bits in the pattern, so I shall let you know, but so far - very good.